Here’s my latest monthly appearance on 25 News Today… on the “Magic of Gratitude”. Happy Thanksgiving! The flow of abundance in life is directly related to our personal “reality”. It’s been shown that we tend to receive exactly what we expect, although often our “expectations” can be largely subliminal and can consist not only of our conscious thoughts and feelings, but also of those that we’re not really all that aware of normally. 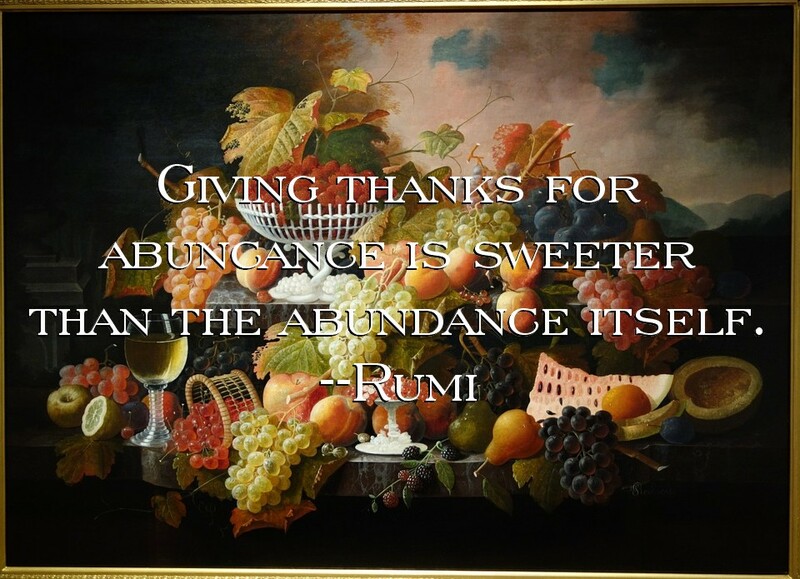 Of course, even “abundance” can be broadly interpreted and quite subjective. What you or I consider an abundant life will no doubt be vastly different from either a billionaire investor or a beggar on the streets of New Delhi. Abundance might be material, for example, earning enough to meet all the physical needs of our family; having plenty of food, clothing, a comfortable place to live, and other physical resources. It might, on the other hand, be far more abstract: abundant relationships, a wealth of personal experiences—for some, abundance might be visiting the ocean and watching the sun setting. It might be simply having mental and emotional health and happiness, regardless of external circumstances. Even if we think of abundance mainly in financial terms, what do we really mean? After all, what is money? Isn’t it merely a symbol? Do small pieces of paper, round metallic discs, or numbers in a digital file have any real value in and of themselves? Of course not. We have simply agreed collectively that these symbols will represent the stored energy of “worth” or “value”. But isn’t this “value” also quite subjective? Isn’t this value simply whatever we decide, collectively, that it is? Are tickets to a Beyoncé concert really worth the same as it would take to feed a family of four for two weeks? So if the value of money is merely symbolic, and even the comparative value of the various resources which money represents is personal and subjective, doesn’t true value come down to a personal choice? When we limit our assessment of our own abundance based on how much money or material possessions we happen to have at a given moment, that limitation is a perceptual one, not an actual one. We do need certain physical resources to be healthy and secure. We need food. We need shelter from the elements, appropriate clothing, a safe environment, etc. If we have anything more than these, isn’t that a form of material abundance? I’m not saying we shouldn’t aspire to more, I’m simply suggesting that we might consider opening to reinterpretation some of our unexamined self-defeating perspectives on our own moment-to-moment conditions and circumstances. Ultimately abundance is an experience, and because of the amazing creative, goal-seeking capabilities of our subconscious minds, when we choose to experience our current circumstances as abundant, we begin naturally creating, attracting, and manifesting more of whatever we personally value. The choice to experience abundance here and now, regardless of our current situation, powerfully re-programs the goal-seeking subconscious mind to unerringly seek out and bring about the “goal” of more abundance, in whatever form is most meaningful. This is why gratitude is such a powerful creative energy. Gratitude is a potent psychological/emotional state which programs the subconscious mind to seek out, create, and attract more of whatever we are most grateful for. Essentially I’m making the case for choosing to experience this moment, in whatever form it may present itself, as filled with abundance. Because in truth, it is. Life itself is filled with an abundance of experience: physical, emotional, psychological, and spiritual. Why not celebrate it here and now, and thereby create more of the same?